You guys, I’m so excited! My mom is coming to visit next weekend. I haven’t seen her since the weekend before Thanksgiving and she hasn’t been to our house since February. We are going to spoil her and take her to some nice fancy restaurants (ok, maybe not fancy but nice!) and let her have the relaxation she deserves! My mom is one of those moms you could live with and it would never bother you. She does her own thing. She isn’t the type to rely on anyone. She’s an early bird. I’m not. When she’s visiting us at our house, she’ll get up at her normal 6 am (BARF!) and make her tea, sit around and read a book. When we wake up around 8am and come downstairs she’s like “ah good morning. I’ve been sitting here drinking some tea, reading my book and enjoying the quiet.” How cool is that?! Let’s talk about this pina colada smoothie. It’s creamy, it’s dreamy and it’s full of tropical fruit flavor. It isn’t too sweet tasting but it surely isn’t bland. It’s the perfect balance of pineapple, coconut and mango flavors. Banana assists the coconut milk with the creaminess. 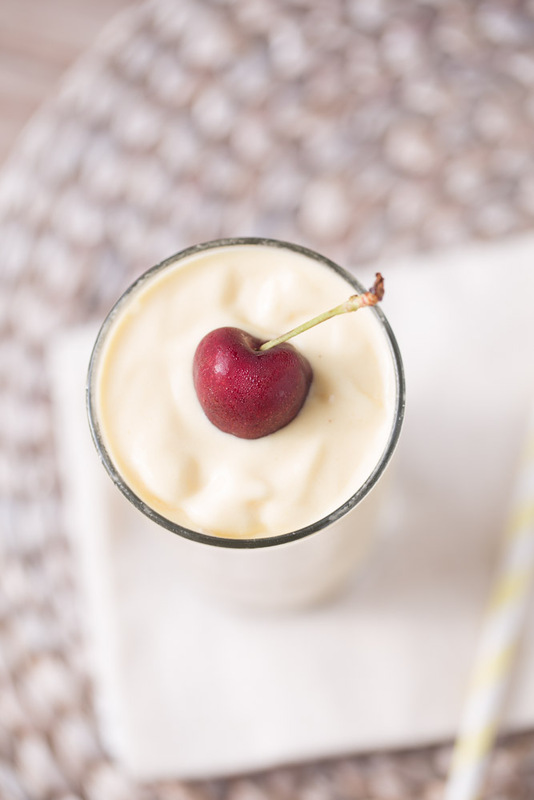 A dash of vanilla extract sets this smoothie apart from similar smoothies that I’ve sipped on. I hope you enjoy this smoothie as much as I do! 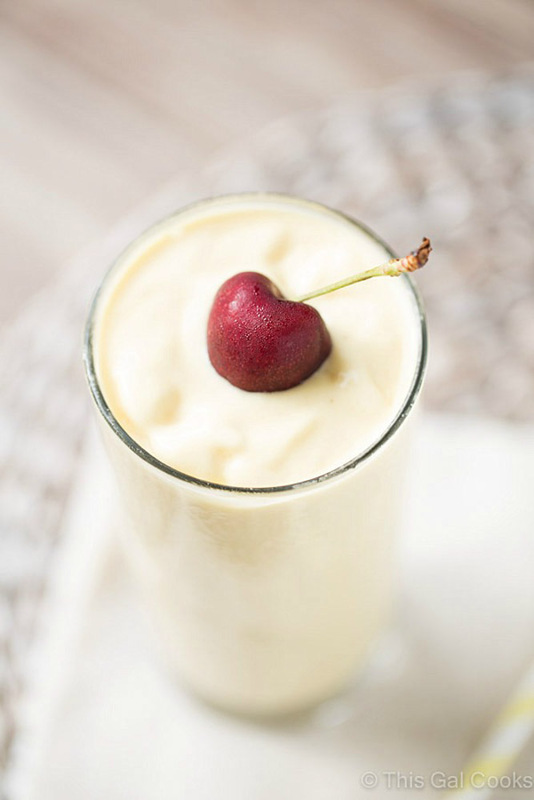 This dairy free Pina Colada Smoothie is full of pineapple, coconut milk and mango. So smooth and creamy and perfect for breakfast, too! Place all of the ingredients in a blender. Pulsate a few times to break up the ingredients and then blend on medium for 1 minute or until smooth. Pour even amounts into two glasses and garnish with a cherry, if desired. I used full fat coconut milk (the kind in a can) in my recipe. It's extremely creamy and that's what I was going for with this smoothie. You can use the low fat coconut milk that comes in a carton to cut back on calories (about 45 calories per cup versus 420 calories per cup for full fat) but I cannot guarantee that it will turn out the way that my smoothie turned out. The smoothie is very filling - I did not feel the urge to eat anything fro 3-4 hours after I drank one of the smoothies. I love that this could be enjoyed any time of the day! That cherry is the perfect garnish! Thanks, Rachel! Anytime if the day for sure! I could totally have one of these for dinner! I make this exact same smoothie minus the mango. Now I will have to try the version with the mango. Killer Good, I am sure! Totally killer good! You’ve gotta try it with the mango, Kristen! I wish I was starting my day with one of these smoothies! Oh yeah! My mom will help with the dishes, too! And she’ll also help out with the cooking prep work. WIN! :) glad your mom is a cool mom, too, Julie! Love this! I just bought 2 pineapples yesterday because I’m craving tropical flavors. Have fun with your mom! It’s always fun when mom comes to visit! 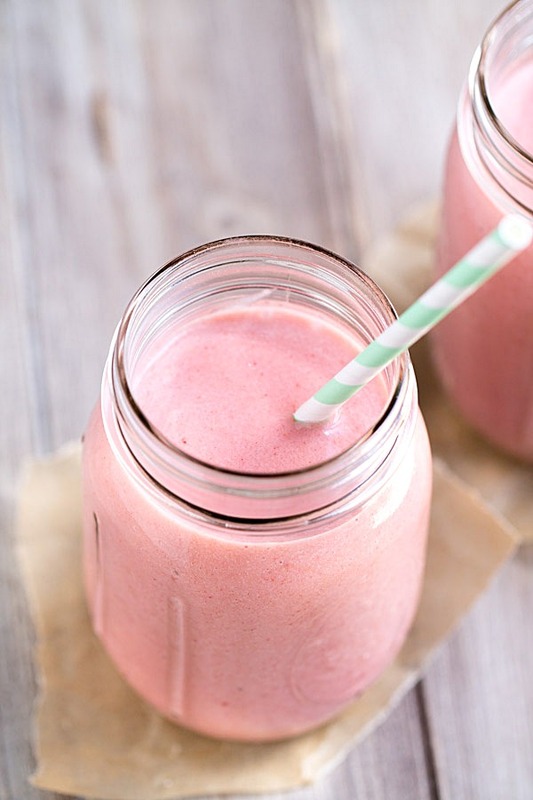 I love the flavors of this smoothie! I’ve never tried a pina colada one before, so maybe it will take my mind off of the negative temperatures that are gracing my area! Pinned! You’re right about that, Gayle! My mom usually goes to bed early so I don’t think she knows the beauty of staying up late! ;) hope you give this smoothie a try! It will surely take your mind of those drastic temps! Yum, this looks delicious! I have used coconut water in smoothies before, but never coconut milk. Enjoy your mom visit! I’ve never tried the coconut water! I may need to check it out for using it in smoothies when I’m craving one a little less rich. Love this! Oh my gosh, I have been dreaming about a tropical vacation to escape the bitter cold and crazy snow we’re having here in Central NY. Doesn’t look like it’s happening anytime soon, so I will just have to make this, crank up the heat in my apartment, and pretend! Yes! Done. Oh no! Well I will send some of our warmer weather up to you, Michelle! I’m in south Florida. It’s been mild to warm, for the most part. How super exciting that your mom is coming! She sounds so cool and laid back, and this smoothie is a must try. Anything with pina colada in it is a win win for me! Yay, that’s awesome that your mom is coming to visit! Aaw and love how cool and amazing she sounds :) This smoothie looks totally amazing too! So creamy and I love the tropical flavors in here! Thanks Kelly! The smoothie is perfect and I’ve kinda been thinking about it all week! I need more frozen pineapple, though. It was on sale last week and the shelves were wiped clean when I looked for it while grocery shopping. Boo! Now this is my kind of smoothie! The cherry is even shaped as a heart… love it! This looks delicious! I’d love to start my day with this yummy smoothie! Fab that your Mom is coming. I mean that in a deep spot in my heart. I would give anything to be posting that. Moving forward I just got a new nutribullet for Xmas. Am I looking for smoothies? Is pina colada my favorite cocktail? Did I pin this? Am I excited to try this? YES to all!!!! I know exactly how you feel. I wish I could post that about my dad, too. He passed away 10 years ago. Aw, that’s sweet of you to take your mom out for nice dinners! Have fun! 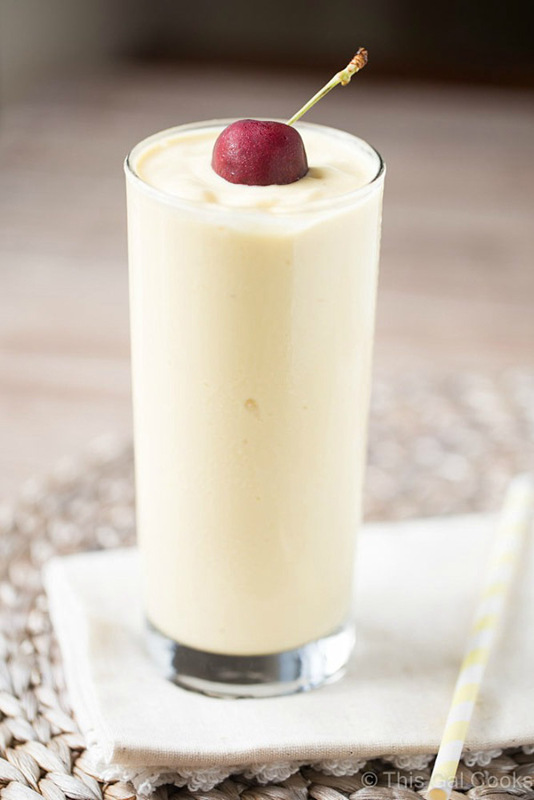 This pina colada smoothie is just what I need right now! Mommies are the best!! Hope you had a great time with yours this weekend! This smoothie is how I want to start my Monday…so I am making it tomorrow!! Thanks Zainab! Perfect smoothie for a Monday morning! Thanks, Aimee! I can’t wait to see your recipe! This looks so delicious Julie! Would it be possible for me to add this smoothie to an inlinkz round-up I’m doing on my blog of fruity smoothies? This will be my breakfast tomorrow :) Can’t wait! Could you be more specific? Was there an ad that started playing sound? My ad networks are not supposed to be running those types of ads so please advise so I can get with them and ask them to remove them ASAP! The ad loaded in 4 spaces on this one page, TPG internet. All 4 started playing sound simultaneously. The recipe looks great but I had to close the page quickly!